If you’re living with the illness of diabetes or know a friend or loved one who is, you likely already know quite a bit about the condition. After all, you live with it day in and day out and are fully familiar with what it looks like to suffer from all that this condition entails. However, there are still things about diabetes that may surprise you. Or, did you know that socioeconomic factors like income level and education may have a profound effect on diabetes? That’s right, it’s not all diet, exercise, and genetics! In fact, according to a study published in JAMA Internal Medicine and discussed on CardioSmart.org, “Poor adults with type 2 diabetes have greater risk of death than those with higher income and education levels.” As a reminder, type 2 diabetes tends to develop in adults rather than children. We will explore this in further detail below. For a deeper look at diabetes and even some surprising things you may not know, read on. You already know about the inconveniences and drawbacks of diabetes: from the relatively minor hassle of having to check your blood glucose levels on the daily to the potentially devastating diseases that may result, the condition comes with its fair share of problems. But did you know there’s another negative effect you may not have considered before? Diabetes could have a negative effect on your salary! According to DiabetesSelfManagement.com, “previous studies have shown that older adults with diabetes, especially those with complications, often face difficulty getting jobs.” The authors of the study wanted to find out if this finding was true earlier in life as well, so they began a study that started tracking people from high school through their early 30s. Why is this the case? The study could not prove causation, but it’s safe to assume that diabetes and income have a negative relationship because those who have diabetes have to spend time and effort managing their illness. It can be difficult to balance the rigors of school, work, and life with the self management needs of the disease. In addition, despite nondiscrimination laws, employers may be hesitant to hire those with diabetes due to uninformed concerns about productivity and the cost of health insurance. Alternatively, those with diabetes may find that they tend to seek out jobs that are lower-paying but afford more freedom and flexibility for self-management, or even stay in place for fear of losing their health insurance if they took a leap and pursued more lucrative employment options. Interestingly, married adults with diabetes tended to have a lower risk of death than diabetes sufferers who are single. In addition, those with college degrees also had a lower risk of death, when compared to those with little education. Low-income adults with diabetes also had a greater risk of death related to cancer. These statistics may not tell the whole story, but they are certainly revealing. As our understanding of diabetes -- and the best ways to treat it -- continues to expand and improve, the hope is that we will see diabetes patients experience relief and better outcomes overall. Want to show your support? Check out events like the National Diabetes Prevention Program’s (NDPP) Kick-Off Event, where various organizations will gather to address type 2 diabetes, working to prevent or delay it as much as possible. The organizations work in tandem to help make it easier for prediabetic people to participate in lifestyle-change programs that could actually serve to negate or reduce their risk of developing full-blown type 2 diabetes, coming alongside them as they improve their health along the way. Keep up with organizations like Juvenile Diabetes Research Foundation (JDRF) and the American Diabetes Association to be in-the-know about upcoming events and opportunities in your area. As more and more people band together in hopes of finding a cure or improving the lives of those with diabetes, there will be a better outcome on the horizon for all. Galas, luncheons, walks, parties, and more -- you name it, there’s a diabetes research event you can attend! Showing your support in tangible ways improves the community as a whole. What are the right methods for cooking with diabetes? Are there some foods that are better than others when cooking, or what you should avoid or stick to when making diet plans? Generally, diabetic people have to make some lifestyle changes when they learn of their condition, and much of this can revolve around the food they eat -- after all, your diet has a major impact on your health. Some general tips from WebMD include cooking with liquid fats (instead of solid fats like butter) -- and using less fat altogether! -- as well as switching to low-fat dairy options, choosing better carb options, going slow on the sugar, and trying out new herbs and spices to help avoid the typical salt, sugar, and butter. Cooking for diabetes doesn’t have to be a drag, nor does it need to be complicated. You simply need to do your research and uncover the best and most healthful options for your diet. Making lifestyle choices, especially in what you eat, that can improve your condition in any way is a good move. We briefly touched on this above, but when it comes to diabetes and its patients’ occupations, there’s a risk for the condition to have a negative impact on a person’s career choices. They may hold back from what they know they can do because they don’t want to risk losing their health insurance by leaving a secure job, or they may worry about having enough time and energy to allot to self managing their condition. Thus, occupations and diabetes is an interesting subject to explore as a whole. What are some good career paths for people living with type 1 diabetes or type 2 diabetes? Really, the short answer to that is: whatever you’re good at! Before we delve in further, it’s important to note that there are some ADA accommodations available to those with diabetes and other disabilities. Some of the accommodations available to those with diabetes include a private area to administer insulin injections, extra breaks for the bathroom and food as necessary, magnification software on computers, the ability to use a service dog, and more. You should research and inform yourself about what accommodations may be available to you from your employer or potential employer. Still, ultimately, the sky is the limit: diabetes patients can even go on to become astronauts! Yep, you read that right. There’s a diabetes patient now who is training to become an astronaut. An article on the JDRF website reads, “Josu Feijoo has spent years training to be the first person living with type 1 diabetes to ever go into space, with Virgin Galactic, the world’s first commercial spaceline. He works with scientists to trial new treatments such as a type of insulin that can be injected without gravity, and a blood glucose measuring device that can transmit results to Earth every 15 minutes.” Josh was diagnosed with type 1 diabetes at just 23, but clearly, he has never let his condition hold him back. At the end of the day, there’s nothing a diabetes patient can’t do if they dream big enough and find ways to make their goals happen. Some careers may prove more challenging for those who have to manage their diabetes on top of their normal work obligations, but that doesn’t mean it’s impossible. Though there are a few careers that are not open to those with diabetes, such as a commercial airline pilot in the United States, there are still plenty of options available for people with diabetes. Diabetes sufferers have gone on to become CEOs, entertainment moguls, managers, fashion designers, chefs, and more. Where there’s a will, there’s a way! And medication can help. Do you know of the best ways to manage your diabetes or the best medications for you to be able to treat your symptoms? This is important information to have, especially so you can have informed discussions with your doctor. At the end of the day, your doctor will be able to recommend the best medication to you, but it’s still worth doing your research so you know what to look for, what you want, and any potential side effects. Some of the top diabetes medications include Invokana, Jardiance, Tradjenta, Farxiga, and Onglyza. We have each of these available for purchase at Canadian Pharmacy World. In fact, we have an entire section dedicated to diabetic medications and products. In addition to prescription medications, we also sell over the counter products and a wide variety of other diabetic products and medications, including sustained release pills, Accuchek glucose test strips and other testing products, generic pen needles, and more. 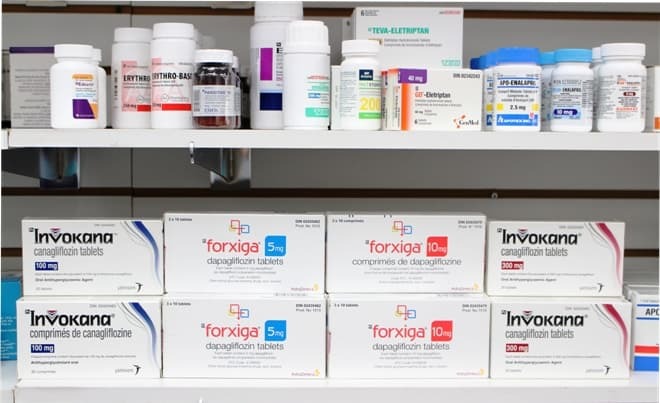 The top oral (or non-insulin) diabetes medications include DPP-4 inhibitors (Onglyza by AstraZeneca, Tradjenta by Boehringer Ingelheim) and SGLT-2 inhibitors (Forxiga by AstraZeneca, Invokana by Janssen, Jardiance by Boehringer Ingelheim). These fall under the category of fixed-dose combination (or FDC) pills, which means they are pre-mixed combinations of two or more different drug classes combined into one single pill. These seem to be quite effective for people suffering from diabetes, but your doctor will be able to provide you the best insight into your particular situation. When taking these, it’s important to be aware of the potential side effects. If you have any questions about our products or service, don’t hesitate to reach out and get in touch! We’re happy to help and answer any questions you may have. Did we surprise you with these diabetes facts? Let us know a fact about diabetes that surprised you or that we may have never heard before!